(CNN) -- Armed pirates have hijacked a Philippines chemical tanker off the coast of Somalia, but Indian forces thwarted an attack on one of its vessels, authorities said Tuesday. 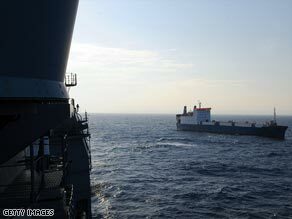 A U.S. Navy patrol monitors the MV Faina -- in the hands of pirates since September 25. Twenty-three crew members were on board the chemical tanker when pirates seized it in the Gulf of Aden on Monday, said Noel Choong, who heads the International Maritime Bureau's Piracy Reporting Center in Kuala Lumpur, Malaysia. He did not disclose the nationalities of the crew members. Thirty-three ships have been hijacked off the Somali coast this year despite increased security, Choong said. Eleven vessels -- most notably the Ukrainian freighter, MV Faina which is loaded with tanks and weapons, seized September 25 -- remain in the hands of pirates along with more than 200 crew. Meanwhile, Indian marines repulsed a pirate attack on an Indian merchant vessel in the Gulf of Aden on Tuesday, the country's defense ministry said. An armed helicopter carrying marine commandoes forced the pirates to abort their hijack attempt, the ministry said. The Indian navy has been conducting anti-piracy patrols in the Gulf of Aden since October 23 to protect Indian merchant vessels on the route. Meanwhile, the Associated Press reported that a multinational force of warships has carved out a narrow shipping corridor off the coast of Somalia that is helping protect merchant vessels from pirate attacks, the force's commander said Monday. Ninety percent of ships transiting the perilous Gulf of Aden are now using the guarded corridor and there have been no hijackings inside the zone since it was set up on August 22, said Danish Commodore Per Bigum Christensen. In a telephone interview from his East African base in Djibouti, Christensen said coalition naval forces were also having success using planes, helicopters and drones to find and track suspect vessels until they can be boarded and searched, AP said. -- CNN's David McKenzie and Harmeet Shah Singh contributed to this report.